This article will help you learn how to grow winter squash in your vegetable garden. Growing winter squash is fairly easy and there are lots of varieties to choose from. Here you'll find information about types of winter squash, when and how to plant your squash seeds, as well as how to grow and how to harvest winter squash. The photo to the left is one of my favorite varieties of winter squash, Sunshine F1, in its early stage of growth. When the fruit is mature, it weighs 3 to 5 pounds and the color becomes a deep orange. There are four main species of winter squash that are cultivated in the United States: Cucurbita pepo, C. maxima, C. moschata, and C. mixta. C. pepo varieties include acorn, delicata, and spaghetti squash, as well as all varieties of summer squash. C. maxima varieties include buttercup, Hubbard, Kabocha, Lakota, and banana squash. C. moschata varieties include butternuts, Long Island Cheese, Long of Naples, Golden Cushaw, and Tahitian squash, as well as several varieties of pumpkins. The best known C. mixta varieties are the Green-Striped Cushaw and White Cushaw. An important reason for knowing the different species of winter squash is that some species are more vulnerable to disease and insect pests than others. For example, the C. moschata and C. mixta varieties tend to be more resistant to Squash Vine Borers. Also, some species can be stored longer than others, with the C. Pepo varieties having the shortest storage life. When deciding on the spacing for winter squash plants, one must also take into account whether the variety is a bush-type, semi-bush type, or vining type. The bush types will tend to have few or no vines and take the least amount of space in the garden. The semi-bush types have some vines, but are still compact. The vining types have many long vines and take the most amount of space in the garden. "First Delicata-type squash with semi-bush habit." Winter squash seeds should be planted after all danger of frost has passed and the soil has warmed to at least 60 - 65Â° F. This usually occurs a couple of weeks after the last frost date. The air temperature should be consistently above 55Â° F. The warming of the soil can be hastened by covering the area with black plastic for a week or so before planting. The optimum soil temperature for planting winter squash is 75 - 95Â° F. But practically speaking, if you're direct sowing the seeds, waiting for the soil to reach this temperature may not leave enough time for your squash to mature. So a good compromise is to wait until the soil is as warm as possible, but plant soon enough so the squash has time to fully develop (indicated as "Days to Maturity" on the seed package). In northerly areas where the growing season is short, winter squash seeds can be planted indoors in pots about three weeks before you plan to transplant them outdoors. Transplant the seedlings into the garden following the same guidelines as for direct seeding. Take care not to start your seeds too early indoors or they will become root-bound by the time they are ready to be transplanted. Winter squash needs rich and well-drained soil, so it is best to amend the soil with plenty of compost. These plants like lots of sunshine and good air circulation. Poor air circulation makes it more likely that they will develop fungal diseases like Downy Mildew or Powdery Mildew. If you're direct sowing the squash, sow two or three seeds in hills spaced 4 to 12 feet apart, depending on the variety. Winter squash seeds should be planted at a depth of Â½ to 1 inch. See the seed packet for the specific spacing and depth for your particular variety. The seed packet will also give directions for direct sowing in rows, if you prefer that method of spacing. Keep the soil evenly moist until the seeds germinate. After germination, thin each hill of squash seedlings to the healthiest plant, using scissors to cut the extras off at the base of the stem. Pulling the extra seedlings, instead of cutting them, will disturb the roots of the one you want to keep. Many people leave two plants or more in each hill, but I find that one plant per hill allows for better air circulation. If you choose to leave more than one plant per hill, then you'll need to start out with 3 to 5 seeds per hill. The vining types of squash are the best choice for this type of planting. To start squash seeds indoors, plant two or three seeds in each 3" pot at a depth of Â½ to 1 inch. After germination, thin them to one plant per pot by cutting the less healthy ones at the stem. Begin hardening off the seedlings about a week to 10 days before you expect to plant them outdoors. This can be done by putting them in a cold frame or by letting them gradually acclimate to the outdoors by leaving them out for longer and longer periods each day, starting with a couple hours the first day. When transplanting seedlings you've started indoors, use the same spacing requirements that are shown on the seed packet. I usually dig a hole and mix some compost into the soil at the bottom of the hole as well as mixing some into the soil that came out of the hole. I then add some water to the hole and wait for it to settle. Then the plant should be removed from its pot. Squash plants don't like their roots disturbed, so be very gentle during this process. Place the plant in the ground at the same level as the plant was in its pot. Fill in the dirt around the plant, pressing it down slightly to remove any air pockets, and then give it plenty of water. "Thick, orange flesh cooks dry and sweet, with buttery rich flavor"
"The first smaller size blue hubbard!" Heirloom. As colorful as an Indian blanket..."
As soon as they're in the ground, I generally cover my squash plants with row covers (garden fabric) held down with small rocks. This keeps them protected from insects, the wind, and any strong sun during their first days or weeks, when they are most vulnerable. When I direct sow my squash seeds, I cover the seedlings as soon as they emerge from the soil. Be sure to leave plenty of slack in the garden fabric, so the plants have room to grow. If you have a lot of insect pests to contend with, you can leave the row covers on until the blossoms begin to open. At this point, the covers need to be removed so the flowers can be pollinated. 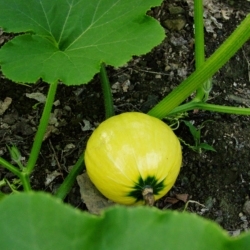 Winter squash needs regular water in order to produce to its maximum. Ideally, the soil should always be moist. I like to mulch my squash plants with shredded leaves or compost to help the soil retain moisture and to keep down the weeds until the plants start to fill out. Additional compost can be added directly around the squash plants at crucial points of growth. Good times to do this are when they start vining, when they flower, and when they begin setting fruit. I usually plant some radishes around my winter squash plants to help deter insects. I also plant nasturtiums to attract the bees that will pollinate the squash flowers. Nasturtiums look lovely when blooming amidst the squash! As the squash vines begin to grow longer, sticks can be placed in the ground to guide them to areas where they will have room to roam. When the fruit begins to form on the vines, place flat rocks or pieces of wood under each fruit to prevent the squash from touching the moist ground and developing rot. Be gentle when doing this so as not to break the squash off the vine. Winter squash can be harvested when the skin becomes very hard and the stems start to dry out. It's best to wait until the plants have reached the "days to maturity" shown on the seed packet. Winter squash can tolerate light frosts, but be sure to harvest before a hard frost. A light frost will increase the sweetness of the squash, but will also reduce its storage life. When harvesting, leave at least two inches of stem attached to the squash. Handle carefully so not to bruise the squash. Don't carry them by the stem as that may cause the stem to break off, which greatly reduces storage life. Squash that has been damaged should be eaten right away rather than stored for future use. I'd love to hear about your squash-growing experiences or any comments on this lens. Have you ever grown winter squash? I really enjoyed your article about growing winter squash and I did pick up some good tips. @hartworks lm: My winter squash plants are doing the same thing this year - in spite of the cucumber beetles and squash bugs. It's getting pretty hard to get in there to water. But I'm having fun! This year our winter squash is on a mission to take over the universe. Watch out,everybody! I love winter squash. We will definitely be adding some to our garden this year. I love squash and have grown it from time to time, this year I'm planting, and have the seedlings for 4 heirloom winter squashes. Two are now in their beds, the rest will probably get there tomorrow! Love the tip of something under the fruits to prevent trouble! I've grown winter squash several times. In our Pennsylvania garden the squash bugs were a major problem until we started using row covers. 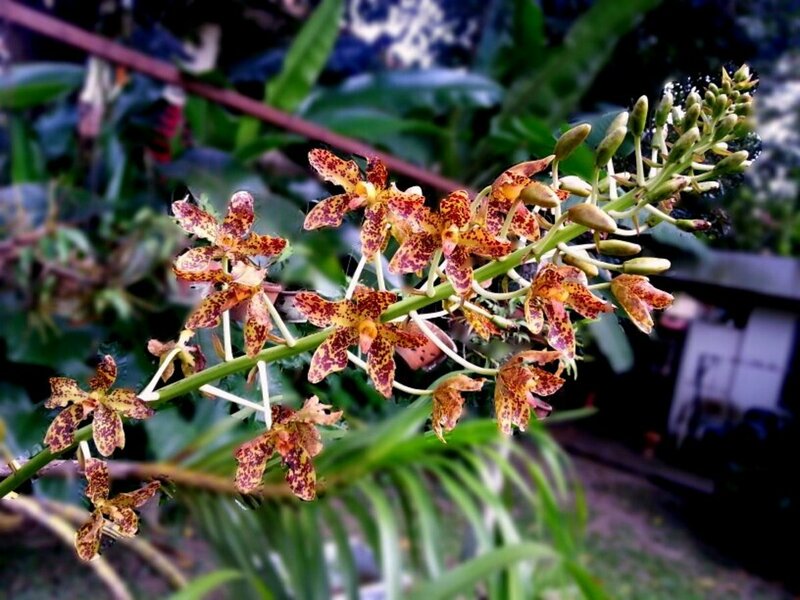 I use them all the time now, and only remove them when the plants begin to get female flowers. I will try the bug resistant hubbards this year - thanks for the tips. I've never grown it but I would like to try it now. I'd love to do this in our garden! Yes, I grow it every year. This is a beautiful lens that has been lovingly made just as your garden has been lovingly sown. *Squid Angel Blessed* and added to My Squid Angel Blessings 2012 in the "Home &amp; Garden Â» Gardening" neighborhood. No,,... I am not into gardening, But the lens are quite amazing! I have never grown winter squash personally but, like Elizabeth, my mom was an enthusastic gardener and she used to. My mother plants a lot of winter squash but it doesn't do well here in the south. @favored: Radishes help to keep lots of different pests away. I plant them all around my garden, especially around squash, melons, and cucumbers And, yes, it works in summer gardens, too. I'm not sure why it's called "winter squash," since it's generally grown during the summer (unless one lives in a very warm climate). Perhaps it's called that because many varieties can be stored over the winter? No I haven't. Your squash seemed to do alright though. Thanks for the tips about using radishes. Will that work in summer gardens as well? Growing squash is fun! Last year I threw out a bunch of seeds that I thought were possibly pumpkin (they had been saved by a friend from years before) It was exciting to see what grew! We ended up with quite a selection. Wow - I have never even thought about growing squash, but I think I 'd like to try! Usful information! Thanks a lot! We don't get enough sun to grow squash in our gardens, so I'm very envious. I love winter because of the wide variety of squashes available in the produce aisle. 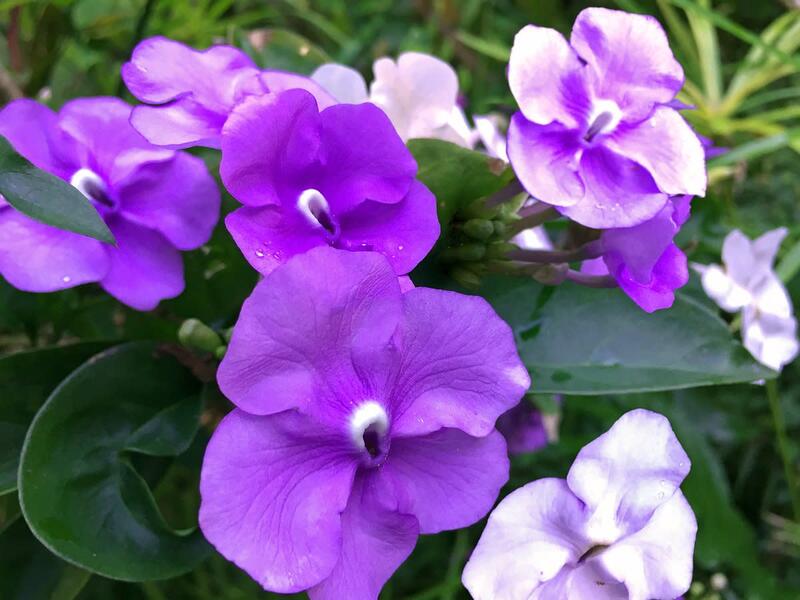 It's fun to read more about them here and learn how you grow them. Well done. Blessed. Yum, I love all squash! Easy to cook and delicious. Good lens on the wonderful variety of winter squashes that one can grow! I've grown acorn squash, pumpkins, butternuts and Hubbards at various times, and look forward to trying some of the smaller, short-season varieties that will have a chance of making it here where I live. Very useful information. I haven't tried growing winter squash yet. Excellent guide! I've never grown winter squash before, but know I know more about it! :) Blessed by a SquidAngel! I love squash - just wish i had a garden to grow some of my own, thanks for sharing this.